This morning I stumbled across something that might interest you noisy creative types! 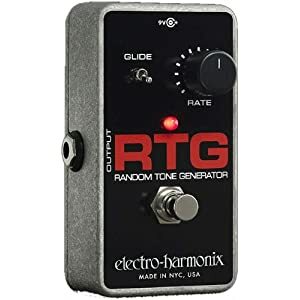 This is the reissue of the of an early Electro-Harmonix synth released in the 80s called the RTG – Random Tone Generator. The Electro-Harmonix Random Tone Generator creates random tones across four octaves. Controls include Rate and Glide. The pedal itself is the source, so no input, just output jack. When things get really interesting is when other pedals are involved. Sounds like a super clean Atari Punk.